LITTLETON was originally Little’s Town (Richard Sullivan Little) and was a rail stop on both the Santa Fe and Denver & Rio Grande Railroads. Littleton began as a farm community in the 1860s, focused on growing food for the rush of miners headed for the gold fields. The community incorporated in 1890, and had an active city government and a volunteer fire department. 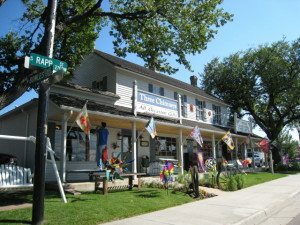 By the turn of the century, Littleton Colorado was a well-established community with many homes, stores and churches. It is our real small town feel in south Denver and every year features wonderful community events, such as Western Welcome Week, and the Candlelight Walk. Orchard road went east to the “orchards” and there were stock yards and other agricultural roots in this now bedroom community of Denver. Today, Littleton offers that true American downtown main street of a small town. The Littleton School District serves the city limits of Littleton, some of the City of Centennial (to about Holly on the east) and those parts of un-incorporated Arapahoe County west of the city. West of Sheridan Blvd Littleton addresses are served by Jefferson County Schools. There are pockets where Denver, Sheidan and Englewood schools poke their noses in. It seems that the majority of the front range communities that are part of Denver are a diverse mix of public systems, charter schools, and private/parochial schools. Charter schools are considered public and will be included in the district listings. Please see the more school connections link for private, charter and home schooling options. NOTE: While many school districts serve portions of Greenwood Village, no single one covers the entire Village. The property address will determine the school district. Sometimes they will overlap…but not always. Littleton uses a Council/Manager form of government. The Council members are elected by popular election and they then appoint or hire a City Manager. The seven members of the council are elected, four from districts in the city and three at large. The Mayor and Mayor Pro Tem are elected by the council. The Council Manager form seems to create a strong combination of the managerial abilities and the political strengths of the other. A wiki link to the city’s history and the official history page of Littleton. Originally, Little’s town, the beginnings of Littleton can be traced to the “Pikes Peak” gold rush of 1859. Along with the gold-seekers came merchants and farmers to provide the necessities of life. As the fledgling metropolis of Denver City began to grow, the need arose to construct a series of ditches to carry water to farms and businesses without ready access to rivers and creeks in this arid land. Among the engineers hired to lay out this system was young Richard Sullivan Little of New Hampshire.